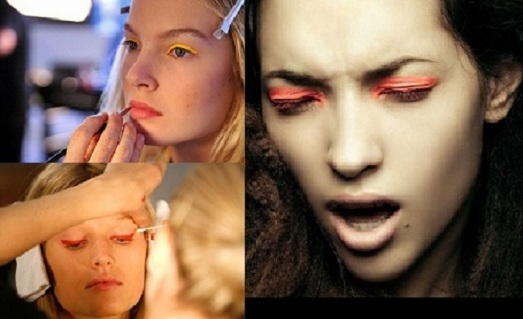 From runways to magazines, bright eyeliner has been making a break-out lately and I'm not so sure how I feel about it. I personally use liquid black eyeliner every day, and occasionally change it up with a purple or blue eyeliner. Makeup artists have been breaking boundries recently though. Reds, oranges, and yellows and everything in between have been seen on runways like Derek Lam and Peter Som. Eyeliner can be found in any color possible and usually it's as easy to find as going to your local convient store, but can this bright-eyed look be translated from runway to every day in a tasteful way. What do you think? Daring or Dreadful? Rihanna doesn't shy away from a bold look. She's been spotted numerous times wearing fierce colors, like the red, purple, and pink seen above. I always wear black eye liner too but I think it would be fun to try this everynow and then. I really like! I think legally you dare, leave the default! And those colors come alive productions! But of course you should use if you really identify. Do not use just because it's a trend, is not it? Wonderful makeup, especially the navy! Dreadful -- at least for me. I could never pull it off! I like the color eyeliners!!! Love coloured eyeliners. 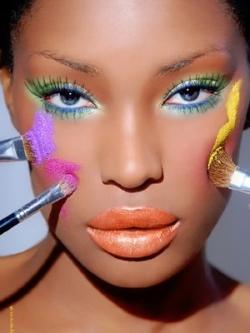 It's fun to play with makeup! Well, I don't know about bright colors for all the time, but I'm really liking the yellow eyeliner haha! Too daring for me. It can look nice sometimes though. Thank you so much for your comment =) I always used to wear bright eyeliner but I've started wearing less make up nowadays, but I might try this out again sometime, although maybe on a night out or something!